Email from my hubby reflecting on our morning. Honestly, today has been amazing. 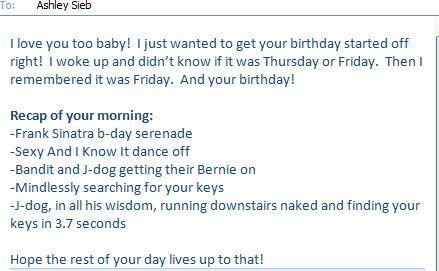 One of my best birthdays ever and it is not even noon yet! I am so insanely happy to be where I am in life…with the people that I have in my life. ﻿24 was a great year for me, but I know 25 will be even better.